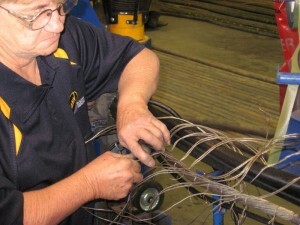 Hahn Electrical Contracting was the first company in the Western Australian Goldfields to offer a full Trailing Cable Repair service. Our dedicated Cable Repair facility is fully equipped with purpose built testing and repair equipment , for prompt and efficient cable repairs. All repairs and testing is carried out in full compliance with AS 1747 and full customer service records and cable history is maintained.